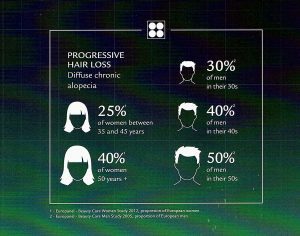 Did you know that up to 40% of women and 50% of men are affected by PROGRESSIVE HAIR LOSS? RENE FURTERER PARIS is a brand that Yoko’s Haute Coiffure has been carrying for over 30 years because of its credibility and trustworthiness, its use of high grade natural ingredients sourced with the utmost respect and its effectiveness and specificity for various scalp/hair issues. Rene Furterer has also maintained its position as the LEADER in ANTI-HAIR LOSS PRODUCTS for 14 consecutive years. 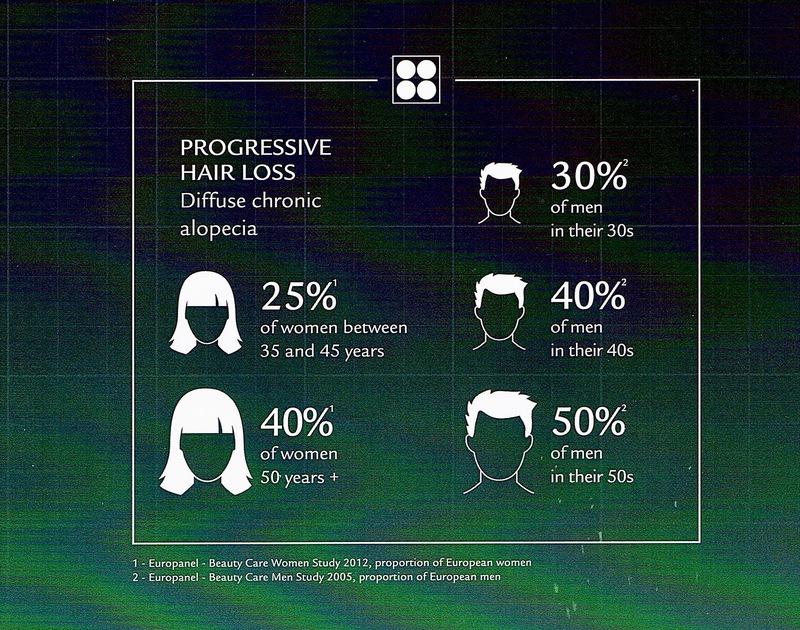 Hair loss may be two types: Reactionary Hair Loss and Progressive Hair Loss. The former is when you suddenly start losing hair around 2~ 3 months following a stressful event, whether it be due to an emotional trauma, childbirth or illness, medication or restricted diet. It is more prominently seen amongst women. The latter is the one seen in both men and women where you have been losing hair for over 6 months. This is commonly known as Alopecia, a gradual loss of hair and a widening of their part. Here, we’ll focus on the solution for Progressive Hair Loss. If you are new to the Rene Furterer line, the most important product that everyone should include in their hair care ritual is the COMPLEX 5: The brand’s cult product, a regenerating plant concentrate that PREPARES the scalp and multiplies the effectiveness of all the treatment products by ten folds. Made with a blend of pure stimulating essential oils of orange and lavender, not only is it a pleasure for the senses, it is a genuine beauty elixir for the hair and scalp. It is a treatment that you do at home once a week followed by the appropriate treatment shampoos and masks . The TRIPHASIC Treatment is a serum which is applied on clean towel-dried hair twice weekly for the first month and once weekly for the following two months. It targets all 3 factors (hormonal / vascular / tissular) responsible for hair loss and essentially extends the lifespan of your hair. It contains natural Pfaffia extract (ie. Brazilian Ginseng), essential oils of orange and lavender and Biotrinine (watercress) which is a new active ingredient that encourages birth of new hair and keeps hair from falling out as long as possible. It also contains Hydrolyzed Curbicia extract to regulate sebum secretion, Vitamin B6 along with ATP (this is RF’s anti-hair loss innovation), all targeting the 3 factors in their own ways. As you can see from the clip above, the Triphasic serum revamped in 2018 now comes in a new packaging. It has a new “stimulating massage tip” which is screwed on to every fresh Triphasic vial you use. 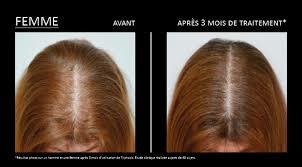 This tip significantly enhances microcirculation in the scalp by 12% while promoting hair GROWTH and STRENGTH. The TRIPHASIC shampoo is a new Stimulating shampoo that the company has just launched this year as the new shampoo which complements and enhances the effects of the hair loss programs. It contains microbeads loaded with essential oils of Orange, Lavender and Rosemary to stimulate microcirculation and purify the scalp, along with plant peptides to stimulate cellular activity. This hair loss program works even better when you incorporate a regular Head Spa service into your hair care regime. It is essential that your scalp is exfoliated and the follicles unclogged and deep cleansed regularly to make room for new hair growth. A regular scalp analysis is also necessary to monitor the progress taking place throughout your treatments. All of this may only be done via a thorough Head Spa service. You may be pleasantly surprised by the results! !